Lately, I have been wondering what will happen to the wonderful work our current First Lady, Michelle Obama has been doing surrounding children’s nutrition when her husband leaves office. Sure, they can hire someone to oversee her beloved garden, and certain of her initiatives have become self sufficient enough to survive. 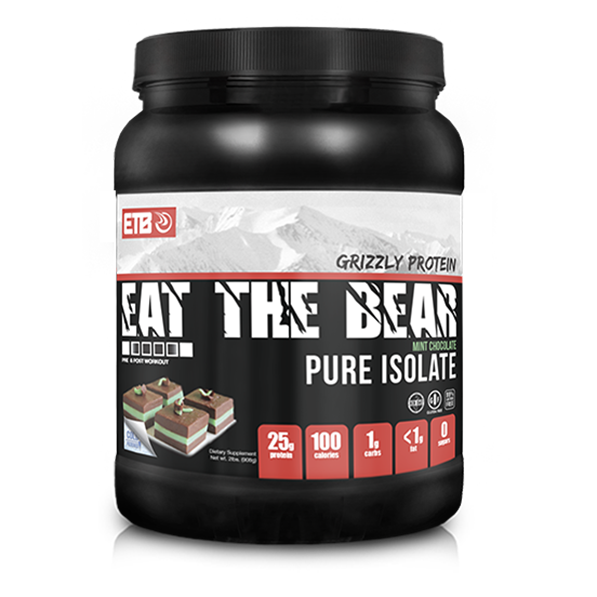 It is highly unlikely that the future First Person will take an interest in nutrition. Bill Clinton already has a foundation and will likely continue his work should his wife become President. Mrs. Trump has not shown interest in any philanthropic or charitable initiatives as yet, and childhood obesity isn’t likely to be an appealing subject for her. My concerns were quickly abated this week, when I was asked to volunteer with a wonderful organization called Spoons Across America, which offers programs dedicated to educating children, teachers and families about healthy nutrition through the culinary arts. My first assignment was to work with a group of fifth graders in PS 1, a public elementary school on the east side of Chinatown in New York City. 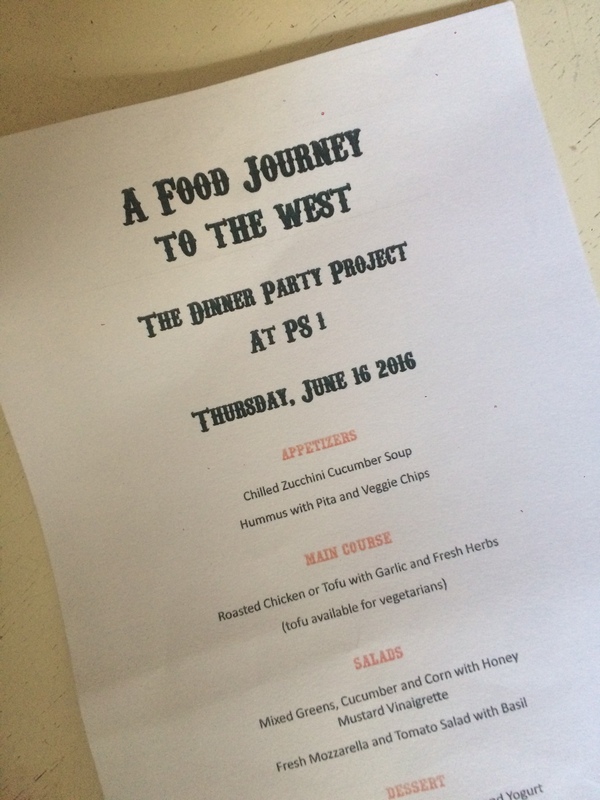 After working in the classroom for several weeks discussing nutrition and where our food comes from, the program culminated in an event where the kids cooked and served dinner to their families, with the help of a team from Spoons Across America. 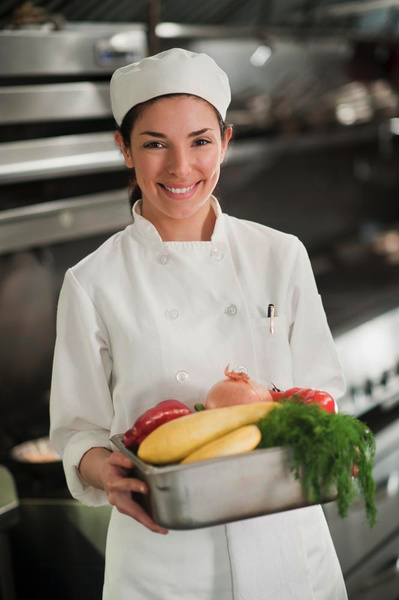 Studies have shown that kids who have a hands-on experience preparing and sourcing new and nutritious foods, are more likely to develop healthy eating habits. There are also findings that show that sharing family meals have both psycological and developmental benefits for children. There are significant indications that teens who regularly have dinner with their families are less likely to use drugs, alcohol, tobacco or exhibit violent tendancies. These facts hold true for all income levels and for families with single or dual parents. With these values in mind, we set out to assist the kids in The Dinner Party Project. 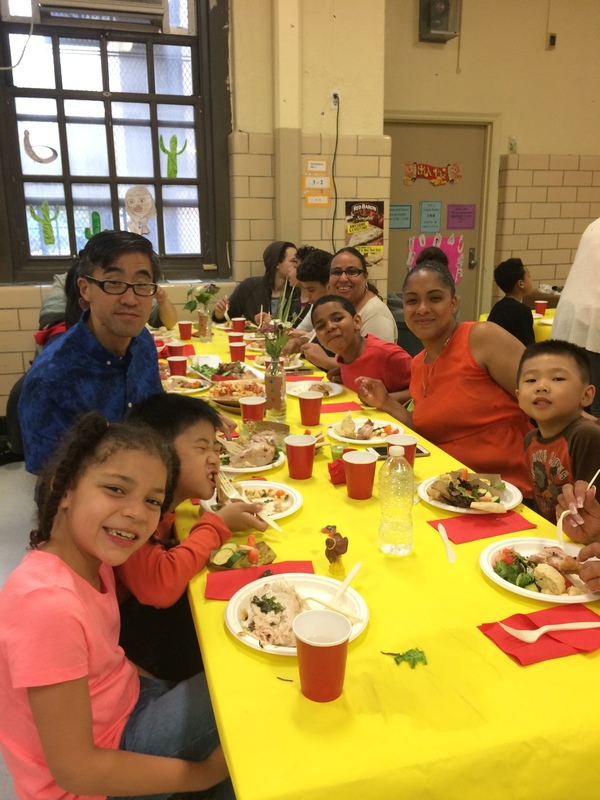 Throughout the afternoon, small groups of students rotated through various stations, chopping, peeling, blending and mixing to create a healthy, delicous meal to be enjoyed later that evening. The menu consisted of chickpea hummus, served with raw vegetables and pita bread, followed by a cold pureed zucchini and cucumber soup, topped with yogurt and a sprig of watercress. The main course was a choice of chicken or tofu, roasted with garlic and fresh herbs,buttermilk biscuits, and a side of tomato and mozzarella salad, or greens with corn, and a honey mustard vinaigrette. 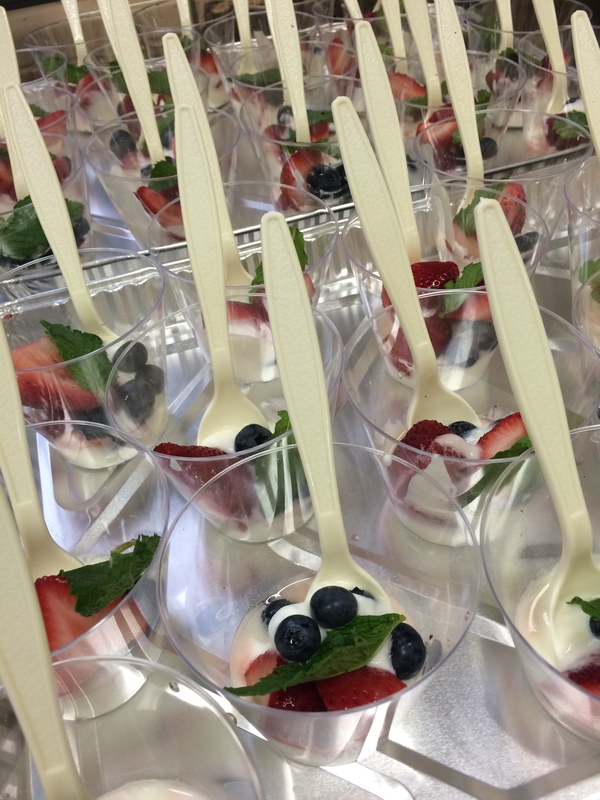 The grand finale was a parfait with fresh berries and yogurt, topped with a drizzle of honey and a mint leaf. 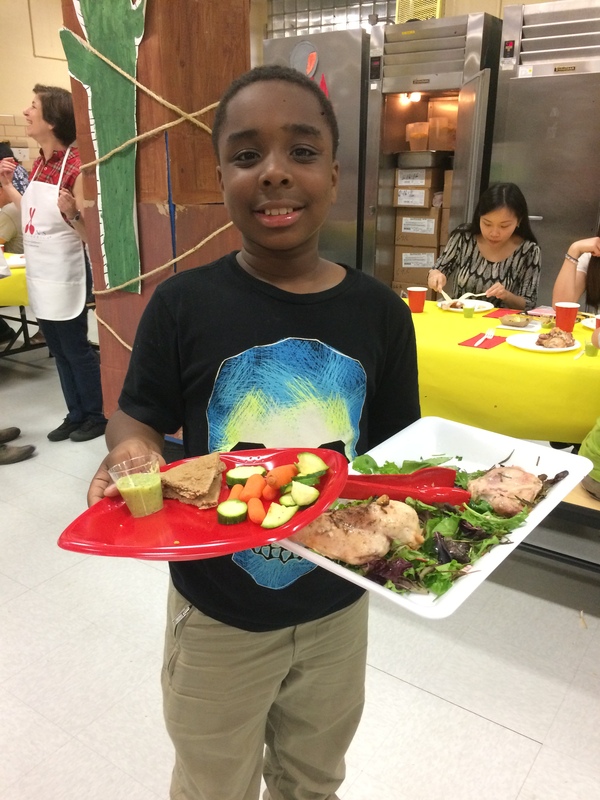 The food was attractively presented, and proudly served by the young chefs themselves. The kids were eager workers, and despite the heat in the small, un-airconditioned kitchen with multiple commericial ovens going, they took to their tasks with enthusiasm and a thirst for learning. My teams made the chicken, and we touched on concepts, such as how to peel garlic, strip the leaves off fresh herbs, and handle raw chicken safely without cross contamination. The greatest joy was in seeing the kids so excited about sharing the food they prepared, and the smiles on their faces as they brought back empty platters to be refilled. It was an exhausting, yet gratifying day, and I hope to be able to work with this wonderful organzation again on other projects. In the meantime, it’s good to know that people have taken up the cause and are doing great work in the world of children’s culinary and nutrition education. Don’t worry Michelle, we got this! To learn more about Spoons Across America, click here. Eating well on the fly isn’t easy. Fast food and vending machine choices tend be high in fat, sugar, and sodium, and low in quality and nutritional value. Luke Sanders agrees, and he set out to do something about it. His latest venture, Farmer’s Fridge, is a kiosk filled with fresh, organic and where possible, local food that is as good for you, and the environment, as it tastes. The company fills the refrigerated kiosk daily, with fresh salads which are high on both flavor and nutrition. 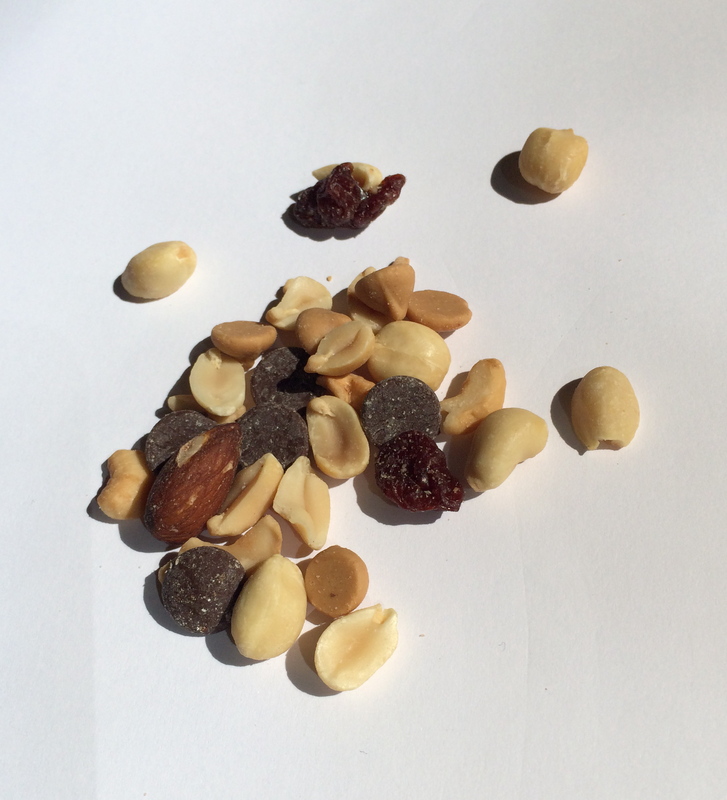 Super foods, nuts and seeds are incorporated into the mix. 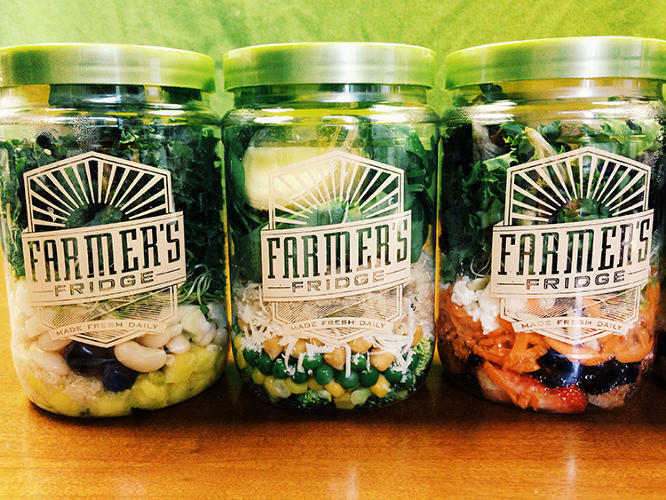 Best of all, they are packaged in BPA and phthalate free, fully recyclable jars. 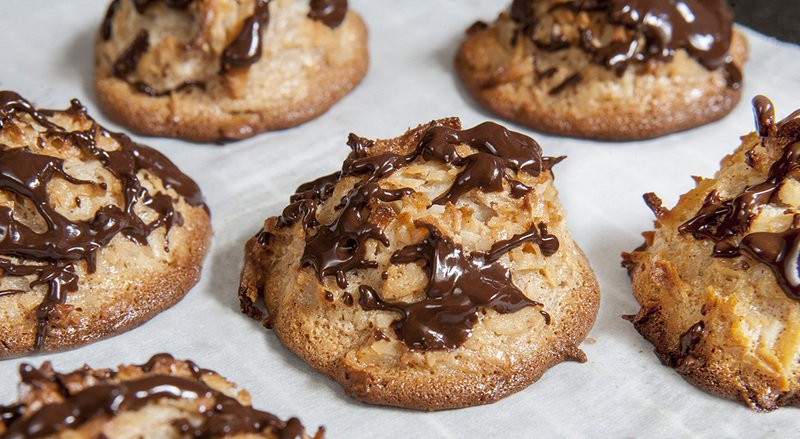 The ingredients are layered to keep them from getting soggy. At the end of the day, the product is discounted, and the remaining salads are donated to local food pantries. The concept is sure to revolutionize the fast food market. While the only one is at the Garvey Food Court in the Chicago area, watch for future kiosks to emerge in other cities across the country. For many years, we have heard that breakfast is the most important meal of the day. It set the stage for healthy eating, recharged our bodies after a 12 hour fast, and prevented us from over eating later in the day, right? A new report from the American Journal of Clinical Nutrition claims there is no study to support that eating breakfast helps us control our weight. Say what?!!! Researchers reviewed material from many studies and found that eating breakfast had little relationship to weight loss. A study from Vanderbilt University compared moderately obese adults who usually ate breakfast and skipped it, against a group who did not habitually eat breakfast and were served a regular morning meal. Both groups were given the same amount of calories per day, and both groups lost similar amounts of weight during a 12-week period of time. It is thought that both groups were given a healthier diet than they usually ate, amounting to more than average weight loss. The bottom line is that if starting the day with a healthy meal feels good and fuels your body properly, go for it. If you wake up with no appetite, it’s ok not to eat until later in the day. As long as you have sufficient energy to power your morning and make good, healthful food choices throughout the day, it’s ok to eat, or not eat breakfast accordingly. Confused? Yeah, we are too. The take-away from all of this? Listen to your body, and do what is right for you. While flipping through a popular health and wellness magazine today, I was a little surprised at some of their nutritional suggestions. I am an armchair expert, admittedly with no formal training in nutrition and look to articles written by others to provide me with much of my information. Through this process, I have a heightened awareness of what is good for you, and what is not. Clearly, some of what I read falls into the latter category. First up on the agenda: The 2013 Healthy Food Awards. In this segment, 175 readers blind tested foods that the editors and contributing registered dieticians selected and deemed healthy. The winners all came in a package, something that generally doesn’t spell “super food” to me. With categories like “best potato chip”, “best nuked popcorn” and “best chewy granola bar” on the list, it’s hard to grasp the concept of these foods being healthy. Alex Guarnaschelli’s Kale and Watercress Soup has white potatoes, whole milk and heavy cream. It is 252 calories per serving. I don’t know about you, but the soups I usually enjoy are closer to 80-120 calories per serving. The potatoes, when pureed, should be enough to give the soup a creamy texture, making the heavy cream and milk unnecessary. Using broth instead of the dairy, would probably add more flavor to the soup, and a fraction of the calories and fat. Instead of the suggested garnish of low fat sour cream, how about recommending a dollop of fat free Greek yogurt? It is lower in calories and fat than the sour cream, and is higher in protein and contains healthy probiotics. As an avid and well-informed reader, I am concerned that a magazine of this type, would feature foods that are processed, high in saturated fat, and not the best, healthiest versions available. This is not a food magazine, where the flavor and ingredients take center stage, nutritional aspects be damned. This is a magazine about healthy eating, fitness and wellness. They owe it to their readers to provide them with informed choices. High fat, high calorie soup is not healthy, just because it has a trendy super-food in it. 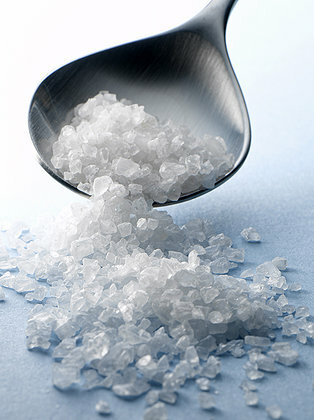 Processed foods laden with preservatives, huge amounts of sodium and a few unpronounceable ingredients, often in potentially toxic packages, are not healthy, just because they are organic, or lower in calories than their counterparts. So how does the average consumer get real information about the seemingly healthy foods that are not in fact, as healthy as they seem? Let me introduce you to a not so secret weapon called Fooducate. Fooducate is a website and an app for smart phones that offers nutritional profiles culled from a huge database of supermarket foods. The free app allows you to scan the food’s barcode, and it provides a breakdown of the item’s nutritional data from a list of ingredients to calories, fat and sodium contents, chemicals and preservatives, information about what makes it a good or bad choice, and sums it up with a letter grade. It is a valuable resource for those who want to make wise decisions in the food aisles. 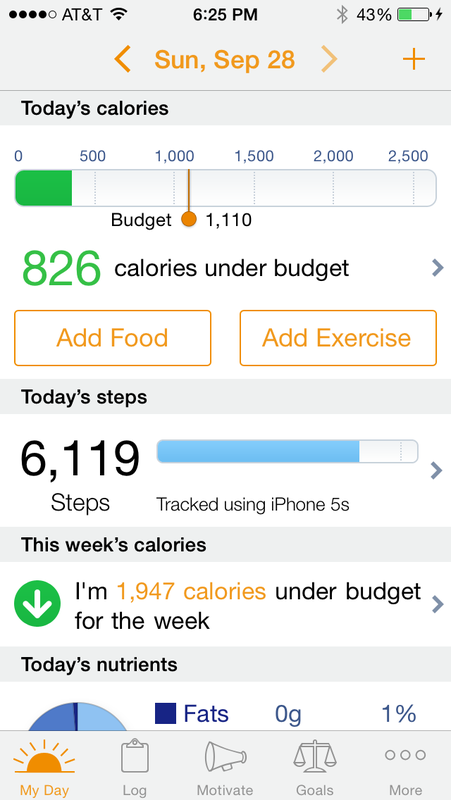 The app also offers daily tips, and can help zero in on gluten free or diabetic friendly foods as well. Perhaps the experts featured in my magazine might benefit from swiping a few of the foods they list, before awarding them best healthy food status.